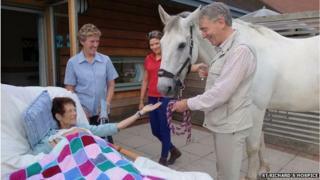 A cancer patient in a Worcester hospice has had a surprise visit from a horse "she adores". Catriona Craig was visited at St Richard's Hospice by 20-year-old Ed, a horse she has been riding "for a long time" in a trip organised by her husband David and Ed's owner. During the visit, Mrs Craig, who has breast cancer, fed Ed mints and petted the former event horse. The hospice said such visits were "calming" for patients. Mrs Craig, from Malvern, has been a patient at the hospice for two weeks. She has been riding from a young age and at one time made her living from schooling horses in the US. She said: "I've been around horses all my life. They are special and good to be around. "Being with horses gives you good feelings." Image caption Mrs Craig says horses are "good to be around"
St Richard's cares for patients and families with cancer and other life-threatening illnesses. Helen Griffee, communications manager, said: "Mrs Craig adores horses and she was absolutely delighted to see Ed. "All of the rooms have double patio doors so she was able to come out into the gardens and get really close to him. "She fed him some of the mints he likes." Care director June Patel said: "We are used to welcoming rather smaller and fluffier creatures but it was great to see Ed making a patient so happy."